Dhoni blasted seven sixes, including one to seal the winning runs, while Rayudu cracked eight sixes and it rained a record 33 sixes last night at the M Chinnaswamy Stadium. A file image of Virat Kohli. 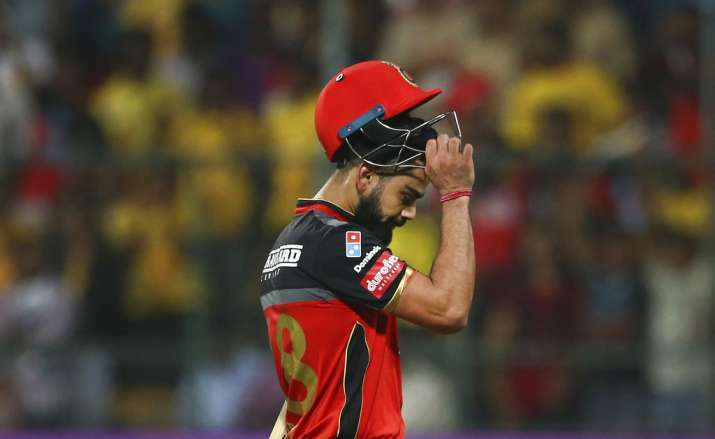 Royal Challengers Bangalore skipper Virat Kohli called it "criminal" after his bowlers' profligacy in the death allowed Chennai Super Kings to chase down 205 in the Indian Premier League. Chasing 206, CSK were reduced to 74-4 but Mahendra Singh Dhoni blazed his way to an unbeaten 70 off 34, while opener Ambati Rayudu slammed a 53-ball 82 to overhaul the target in the last over with two balls to spare. Dhoni blasted seven sixes, including one to seal the winning runs , while Rayudu cracked eight sixes. It rained a record 33 sixes last night at the M Chinnaswamy Stadium. "The way we bowled is just not acceptable. Just not good enough on the day, 72/4 and giving away runs like that for just 1 wicket is criminal. Something that we need to address going forward because we haven't bowled well. If we cannot defend even 200, it's a problem somewhere," Kohli said after the match. "We have to back the guys and have enough confidence in them and they need to be clear in their head to execute things. The pitch played really well, spin played a massive factor. Some quality batting with both sides getting 200. "Great game for people to see but as a team, we are disappointed to not get across the line," added Kohli, who was also fined Rs 12 lakh because of slow over-rate. Kohli heaped praise on Rayudu and Dhoni for their blazing knocks. "Rayudu has been around for 15 years now. He's a quality player and he's done well for India. You never know who gets a chance somewhere and I'm happy for him," he said. "Dhoni is looking in really good touch, he's hitting the ball really well this IPL but not great to see it against us." Dhoni, who was adjudged the Man of the Match, said it was a difficult chase. "I thought it was a difficult chase when I saw AB batting to see them over 200, I thought it was 15-20 beyond par. We also lost some key batsmen early but it's a small ground, the ball travels a lot here, there was some dew, not a lot. Overall, it went according to the script, not according to how we would have thought but went well," he said. "This was a slightly slowish wicket, AB's innings was very special, it seemed as if he took them at a really good pace, especially against good quality spinners. "Credit goes to the spinners and it's good to be on the winning side, everyone is chipping in, we're chasing totals and Thakur is bowling well, he was under the pump earlier." Describing the chase as "unbelievable", Rayudu said they wanted to play out Yuzvendra Chahal, who scalped two wickets in an impressive spell. "Unbelievable... We lost a few wickets early, but on this ground anything is possible. I'm not really bothered (about where I'm batting) because I'm hitting the ball really well. We had the belief and we were calculating which bowler had how many bowlers, we just wanted to play out Chahal," he said.